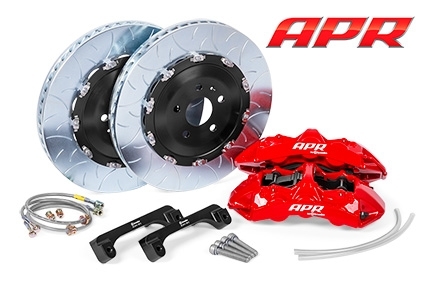 Brembo has consistently offered uncompromising solutions that harmoniously mesh with APR’s performance upgrades. Through decades of research, development and championship wins the world over, Brembo has created unique systems that outperform the competition on the track, while simultaneously offering a civilized daily driving experience. Expect an excellent resistance to brake fade, unmatched stopping power, and reliability that will stand the test of time. Each APR by Brembo Brake system features red six-piston monobloc calipers with billet brackets, Brembo’s Type III two-piece floating discs, Goodridge braided brake lines and TS20 brake pads. Every system is custom tailored to the vehicle on which it’s being installed to ensure a seamless integration with the factory master cylinder, ABS and traction control systems. Each APR by Brembo Brake system features red six-piston monobloc calipers with billet brackets, Brembo's Type III two-piece floating discs, Goodridge braided brake lines and TS20 brake pads. Every system is custom tailored to the vehicle on which it's being installed to ensure a seamless integration with the factory master cylinder, ABS and traction control systems.